Homemade roasted red pepper hummus is a snap to make, and it tastes so much better than store bought! 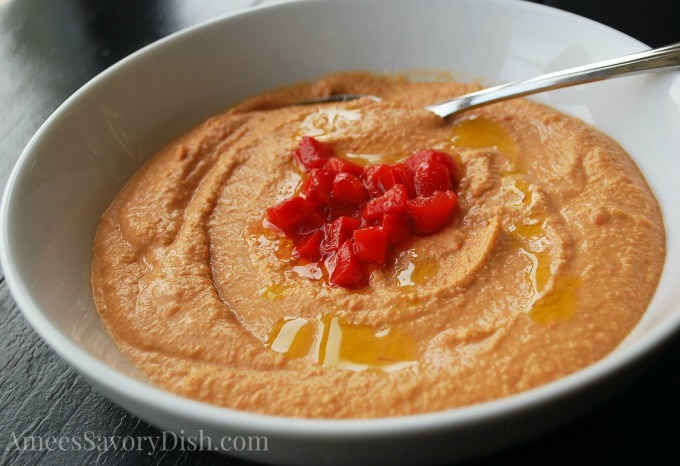 If you are obsessed with flavored hummus recipes, like I am, you are going to love this easy recipe for homemade Roasted Red Pepper Hummus. This dip is loaded with good fiber, protein, vitamins and minerals and tastes delicious, too. It also makes a perfect holiday party appetizer. I used my new Stack & Snap Food Processor from Hamilton Beach to make this dip. I love this handy appliance for whipping up quick recipes, it’s easy to assemble, unlike other processors with a lot of separate components. It also cleans up easily, is light weight, doesn’t take up a lot of cabinet space and has these great suction cups on the bottom “feet” to keep it from moving around on your countertop during use. The Stack & Snap food processor comes with a chopping/mixing blade and reversible slicing/shredding disc, making it useful for so many different recipes. Also, all of the parts, except the base can be thrown in the dishwasher. This is a HUGE bonus for me. I don’t like things that I have to wash by hand. I cook my a** off, so the last thing I want to do is wash a bunch of dishes! For more info about the Hamilton Beach Stack & Snap, visit their website. Here’s the cool part, you can enter below for your chance to win a Stack & Snap for yourself! Entry is simple, so don’t miss out! 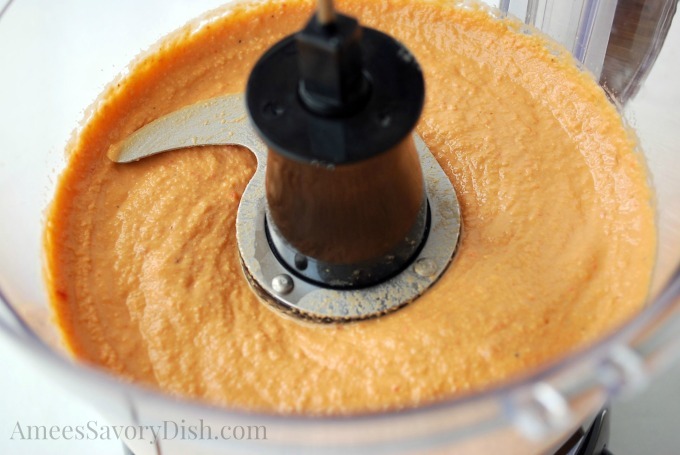 I hope you love this homemade roasted red pepper hummus as much as I do! Process all ingredients in a food processor until smooth, scraping down sides a couple of times during processing. Cover and chill until ready to serve. Garnish with a drizzle of olive oil and chopped roasted peppers. Serve with carrots and pita chips. 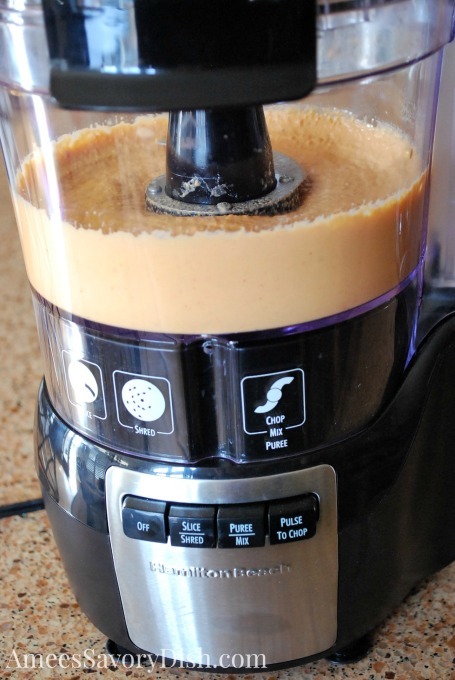 * I was provided with the Hamilton Beach Stack & Snap food processor in exchange for a review. All opinions are mine. I don’t own a food processor and I’d like to make something like this hummus. I want to win this to try some amazing recipes. I love that it can be used for so many different recipes and that most of the parts are dishwasher safe. This is the perfect size processor for pesto! I’d like to win because the handle just broke off my old Food Processor and this is something I use all the time! I hope I win! I use it for so many things — margaritas, sauces, guacamole, etc. I love that it’s easy cleanup and the size makes it perfect for those small jobs. I love cooking and have always wanted one of these. I don’t have a food processor and I would love to make homemade hummus, salsa, pesto, the list goes on and on! I don’t have a processor and I would love to make homemade hummus, salsa, and pesto! I would love it mostly for the cookie truffles and fresh salsa. i would like to make my own nut flours with it. Seems like a device that my dad would love. He’s so into cooking. I would love this to make dinner for my fiance when we move in to our new house!! I make a vegetable dip for my kids that they love with processors. It would come in handy for making all sorts of things. Don’t have a processor. Would love to win.Thanks for the chance. Would be handy to have in the kitchen. I like the size, perfect for my salsas and dressings. Great for cole slaw, too! Food processors are so easy to use in the kitchen. I love these types of items and would love to add this to my collection. I think it would make many of the chores around the kitchen easier and faster! I’d like a Stack and Snap because I would love to make some new recipes. I have never owned a food processor. I would love one because it would be great for chopping without hurting my eyes as much. Thanks for the giveaway! I would love to make my own hummus this would be awesome!